Engine Failure on Takeoff (Read : Sudden Bang, Vibration, Fire, Smoke, Fire Bells and other Cautions and Warnings) at the most critical point on Takeoff (V1) is pretty ubiquitous in our Check and Training regime and our Regulatory Matrix. We pretty much see at least two of them (One for You … Ta … One for Me … Thanks …) every six months in the Simulator, from somewhere in the middle of our initial Type Rating through the end of our Airline Career. Given with engine reliability they way it is these days, most pilots are never likely to see an Engine Malfunction of any sort – let along the sudden and complete loss of thrust at the critical moment on Takeoff … it seems a pity with all that training and preparation that we don’t get to see this event in the aircraft. Ok, perhaps not. This diagram overviews a sequence profile for Engine related NNM’s during takeoff and must not be extrapolated across the spectrum of other takeoff NNMs or other phases of flight – refer to the Boeing FCTM/ QRH. Between A/Thr HOLD and lift-off, only manual advancement of thrust is available. Once airborne the TO/GA Switches are available. It is acceptable to push the thrust levers forward below 400ft to increase thrust and still preserve LNAV/VNAV engagement. The A/Thr re‑engages at 400 ft AAL if VNAV engages and re-sets any de-rated takeoff thrust. PM may call “Engine Problem” or the relevant EICAS message during takeoff – however nothing should prejudice the requirement for “Rotate” and “Positive Rate” from the PM. If performance is marginal and PF is struggling with flight control, PM can consider a call of “TOGA Thrust Available” at the appropriate time. If the PF is observed to be trimming with TAC available, a call of “TAC is Available” can be a helpful reminder not to trim / or to cancel any manual trim inputs. AP engagement is strongly encouraged above 200 ft with flight path and performance stabilised. The aircraft does not have to be trimmed, but should be In Trim before AP engagement. Apart from rudder pedal feedback, TAC failure will be indicated by EICAS after the takeoff inhibit ends (approx 200 ft). 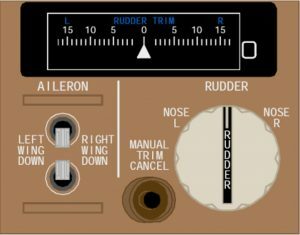 If the aircraft is accidentally trimmed with TAC engaged, use of the Manual Trim Cancel Switch will remove pilot trim inputs. The correct technique for manual trimming achieves Control Wheel Neutral, with a slight angle of bank towards the live engine. TOGA Thrust should applied as required by flight path and performance, by the PF. PM may suggest as appropriate. While FMA HOLD is active, the thrust levers can be moved forwards by the PF without TOGA Switch use. If TOGA lateral tracking is incorrect, one option is to steer the required track and re-select TOGA. Note this will deselect LNAV/VNAV arming/engagement. The “400“ ft (RA) call is a lateral awareness standard call. During EFATO this call serves to remind the PF to consider the EOSID and the APFD modes required to follow them – such as runway track/track select when the normal departure LNAV/SID requires otherwise. EOP/EOSID Navigation takes priority over failure assessment and checklist/memory items. The AFDS limits bank angle engine out (HDG/TRK SEL in AUTO) to 15° until V2+10 kts, then increases to 25° at V2+20 – unless in LNAV. If full manoeuvring is required in HDG/TRK Select, the bank angle selector must be utilised to increase the limiting bank angle. Engine Out Procedures are based on still air, speed between V2+15 and 200 Kts, with an angle of bank varying with increasing airspeed above V2+15. The EOSID is commenced irrespective of achieving engine out acceleration height, depending on EOSID specification. The second segment (2) can be extended using Speed Intervention. Remember to cancel Speed Intervention when Memory Items are complete. If the 10 minute thrust limit is reached, CON thrust can be selected in order to avoid exceeding certified thrust limits, terrain permitting. Crew should consider terrain clearance before commencing a sequence of NNM checklists. However this does not require reaching MSA or LSALT prior to continuing with the NNM. The “Short Term Plan” is used to manage short term flight path and navigation requirements between Clean/CON and completion of the NNM checklists. Typically the short term plan will conform to that briefed during the Departure Briefing and cover items such as immediate tracking/altitude requirements, any likely need to hold/jettison and general intent of destination. NNM checklists NOTES may well change these considerations. Students are often taught during engine out training to target a pitch attitude of anything from 8° to 12° after takeoff rotation. This is because a pitch attitude more than this usually results in a subsequent loss of airspeed to V2 (or below) and a necessarily correcting pitch change to recover. Typically, engine failures in the simulator are practiced at maximum landing weight with de-rated thrust. It is common (in the simulator) to see a student pitch to about 12° after an EFATO which initially results in a stable speed – but then as the Landing Gear retracts the speed decays and a pitch attitude at or below 8° is usually required (with an associated loss of climb performance) to recover. Typically, this recovery manoeuvre is necessary just as the student has commenced trimming the aircraft – hence the previous admonishment to aim for 10°. However, the Boeing FCTM is quite specific in this area. It should be noted that Boeing FCTM guidance is intended to cover the full operating envelope of the aircraft – from lower weight take-offs with high thrust settings, to higher weight take-offs with de-rated thrust. Engine out takeoff rotation should have the following characteristics. Flight director pitch commands are not used for rotation. 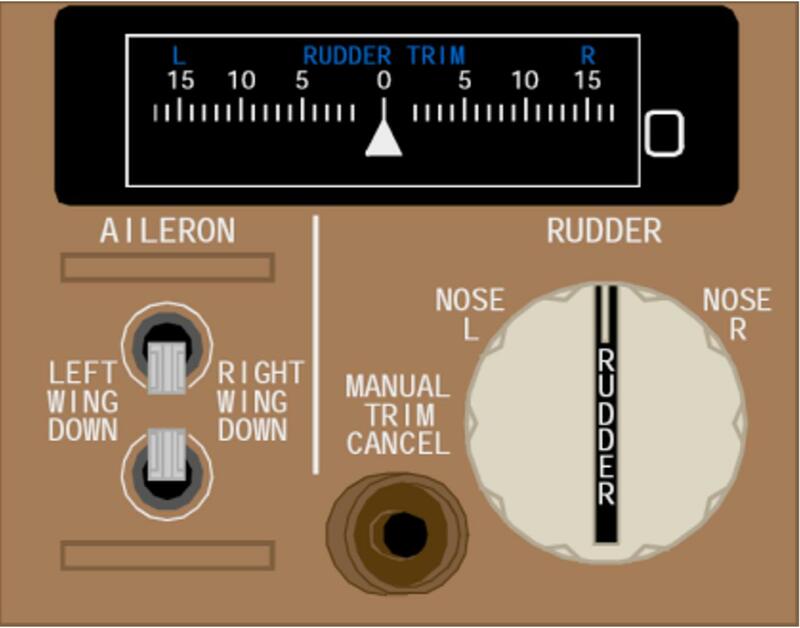 Once Airborne, adjust pitch attitude to maintain desired speed (V2 to V2+15 knots) – note that shortly after airborne this is the guidance the Flight Directors should provide. As such, it is incorrect to teach (or target) a pitch attitude of 8° to 10° for EFATO – not the least of which because this may delay lift-off. The best advice regarding this issue is to follow the FCTM rotation guidance. Then once airborne, fly the aircraft until the gear is fully retracted and the pitch attitude and speed stable, before commencing a distraction such as trimming. Beware of the flight director indications until you have achieved this stability – continue to fly attitude and airspeed until fully airborne and stable. At this point the Flight Directors provide guidance to achieve V2 to V2+15 and are valid for use. Note that if the aircraft is allowed to slow to less than V2 the Flight Directors may well command a descent to recover the speed. Finally, the increase in drag associated with gear retraction can be just the factor that turns a slightly high pitch attitude with a stable airspeed into an airspeed below V2 event. Boeing specifically delineate the rudder trim as in the PF’s area of responsibility. As such the technique of the PF asking the PM to set a specific number or trim units is clearly against the intent of the Boeing SOP, and not encouraged by Manufacturer SOPs. This technique comes generally from an observation during EFATO simulator training of the PF reaching for the rudder trim shortly after rotation and either (a) focusing on the trim to the detriment of aircraft flight path control; or (b) trimming in the wrong direction. This issue is usually the result of unfamiliarity with the rudder trim control (a training issue); or the tendency of the PF to trim too early after an engine failure. The solution to this is usually to delay trimming until the aircraft is stabilised, in trim (sufficient rudder deflection to centralise the control wheel) and climbing adequately. Trimming prior to this point (and prior to the completion of the gear retraction cycle) is usually premature. A suggested technique is to first concentrate on flying the aircraft to 200 ft RA. This is the earliest point that the AP can be engaged – if the aircraft is under control, climbing adequately and in trim (rudder input sufficient to result in zero control wheel input); the AP should be engaged. Then make a conscious decision to review the need for trimming (has the TAC failed?) and deliberately establish a trim setting appropriate to the rudder demand. Typically by 200 ft the EICAS inhibit has ended, and while it would be inappropriate to start running Checklists at this stage, a quick look can confirm the status of the TAC if there’s any doubt, rather than peremptorily releasing the rudder. There are a number of home-brew techniques for trimming such as using Fuel Flow on the operating engine as a numeric guide (14 tons/hour needs 14 units); or approximate trim settings (Climb : 12; Cruise : 6; Descent : 3 Units) which generally work well enough – but essentially sufficient trim achieves control wheel neutral with a slight angle of bank and small displacement of the slip indicator towards the live engine. The Engine Limit / Surge / Stall NNM checklist memory items often complete with the engine at idle thrust and the engine still stalling/surging. Any further memory action by the crew should only be contemplated if flight safety is considered at risk. From the design of the checklist, Boeing clearly don’t consider a stalling/surging engine at idle thrust a threat to flight safety or the checklist would continue the memory items to engine shutdown. 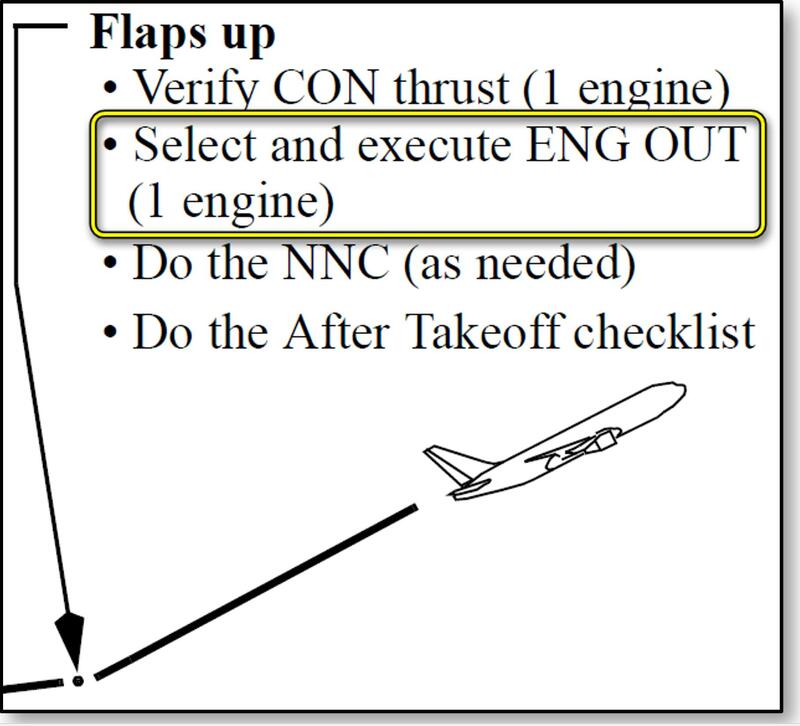 The technique of continuing the checklist by memory to Fuel Control Switch … CUTOFF to secure an engine that’s stalling/surging at idle is not recommended unless the safety of the aircraft is at risk, which would be unusual for a surging/stalling engine at idle thrust. 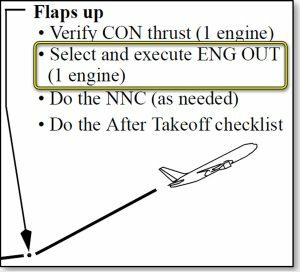 Complete the memory items as scripted, accelerate and clean up (takeoff scenario) and when clean/CON – then run the NNM checklist to secure the engine. The Boeing FCOM/FCTM stipulates the selection of <ENG OUT on the CDU VNAV page once the Flaps are selected UP and CON thrust is set. This is a relatively new step, as traditionally the selection of VNAV – ENG OUT was left to the crew, who would usually only select it for diversions to ensure appropriate speed/altitude recommendations and predictions from the FMC for longer distance flying. Selecting ENG OUT at this point will change the VNAV speed, typically increasing speed above UP speed to a higher value for climb to cruise. If this is not desired the selection of speed intervention by the PF prior to execution of the modification retain speed control to the PF. When the PM is actioning the FMC VNAV ENG OUT – calling any changed altitude (when above ENG OUT Maximum Altitude) and the change in SPD is a good situational awareness promoting habit. There is more than one way to skin a cat and while I’m no necessarily interested in Cat-i-cide, I am interested to learn about other techniques used in your airline to teach and conduct engine failure and engine failure on takeoff. Feel free to send me feedback on what is here – and don’t forget to check out the link to the Procedures and Techniques document on the front page.